This is part of our ongoing series on Scaling Customer Service, based on our Customer Service Scaling Timeline. This month we’re covering Stage Two. One of the most exciting customer service innovations to reach smaller companies in the last few years is live chat. While enterprise companies have had access to this tech for several years, it’s just become affordable and light enough for companies like Zopim, SnapEngage, and Olark to offer it to regular-sized companies. Live chat allows companies to provide instant customer service by chatting with customers while they’re trying to use the product, providing unprecedented potential for insight and retention. So, is live chat the future? The potential of live chat is undeniable. Increasingly customers want support at the speed of conversation, and chat allows this. The ability to offer instant help to a customer before they get frustrated is an incredible way to build customer satisfaction. And the personal nature of chat both increases customer friendliness and affinity with the company. The problem is that live chat is an expensive time investment. 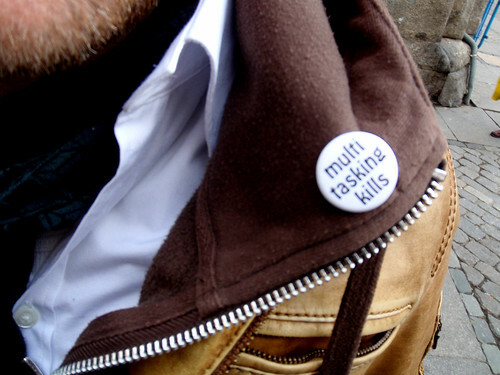 We’ve read all the studies that say that multitasking doesn’t really work, and in fact keeps us from doing our best work. Live chat is a living distraction. Whether you’re writing something, programming, or even responding to customer tickets…once you hear the “ding” of a live chat, your brain is derailed. Even worse, the customer on the other end may have large gaps in their response – giving you just enough time to restart your previous task before getting distracted again. 2. If you do it badly, it’s worse than not offering it. The world is all about expectations. If you list an average response time of 4 hours on your support page, your customers won’t get as upset if they don’t hear anything in hour 3. If you tell your customers that the product will arrive in 3 days and it arrives in 5, they’ll be upset. The same thing applies to live chat. If you don’t respond to a live chat, it’s a slap in the face to your customer. Clearly, they’re not worth your time. But just as bad is the plethora of “currently offline” live chat widgets across the web. If a customer encounters a live chat widget, they expect to be able to talk to you right away. The lack of an on-duty agent is upsetting; they got their hopes up about live chatting and now it’s gone. Removing the widget from the page when offline isn’t much of an improvement. Customers who previously used your live chat will now wonder where it’s gone, and crankily resort to a standard message. Despite the above, connecting with your customers so instantly and personally is completely powerful. Nobody is denying that. So, what’s the punchline? Should I use live chat? During the second stage of our Customer Service Scaling Timeline, we suggest you give it a try. Unless you’re flooded with customers (in which case, congrats! ), you’re going to want to do whatever you can to reach those using your product and find out what you can do to make it more addictive. In our view, live chat quickly becomes unmaintainable after this phase, and isn’t really practical again until you can have someone dedicated to it full time…at which point, it once again becomes a reliable and powerful way to connect with, help, and delight customers. Are you a UserVoice customer? Check out SnapEngage’s live chat integration with UserVoice. Pin photo courtesy of Daquella Manera.